Valles Mines without the A.P. 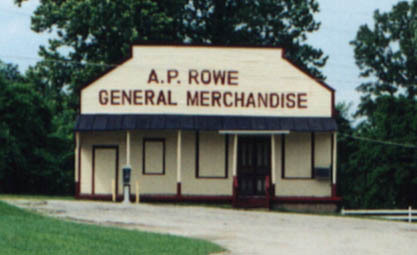 Rowe General Store cannot be imagined. Located in Valles Mines a hundred yards from the Mississippi River & Bonne Terre Line's train station on the north side of town. For how many decades when you picked up your mail could you be sure to find the smiling face of U.S. PostMistress of Valles Mines 63087, the one and only Evelyn Rowe Snider? Or Pete Snider behind the counter always ready with the idea of how well an ice cold Coke in a glass bottle would go with that ice cream sandwich? It did. Need gas? The single Red Crown, then Standard pump waited patiently. And for generations before them, the Rowes made sure no one went without necessities of life both within Valles Mines and DeSoto. The store in Valles Mines is currently closed, orphaned from the Mines by a new highway interchange that, ironically, Evelyn Snider fought to get for 37 years. The Store's Post Office, once a Norman Rockwell painting of American Rural Life at its best, was declared a fire risk by the US Postal Service and has been moved out to a trailor on top of where the railroad station once stood (Please visit our Lost History Museum to see the original station building and locomotive).